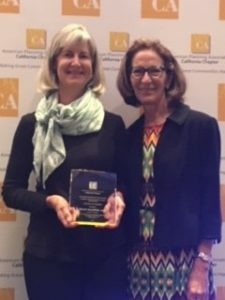 A hearty congratulations to Susan B. Baldwin, AICP, for winning a Planner Emeritus Network (PEN) Award at the 2018 APA California Conference in San Diego! The PEN is a distinguished group of planners that have contributed to meaningful planning efforts over the course of their careers. Susan won the PEN Award because of her extensive involvement and dedication to the planning profession and to the people within the communities that she has served. Susan’s long-term focus on housing issues, including affordable housing, homelessness, transit-oriented development, smart growth, active transportation, intergovernmental review, and advocacy, has been admirable and inspiring. Susan traveled across the country from her birthplace of Washington, D.C. eventually settling in San Diego, CA, where she dedicated herself to thoughtful, long-term, and meaningful planning efforts, resulting in tangible policy-based outcomes at the local, regional, and state levels. 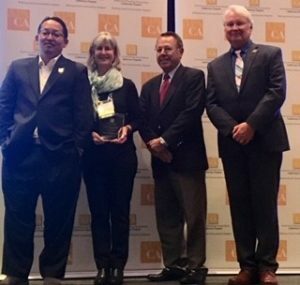 Her commitment to the planning profession has been evidenced through the ethical, visionary and ground-breaking work she has accomplished, her volunteer efforts in not only the APA but also other prominent organizations in the San Diego region, and the awards she has won over her lifetime, including the San Diego John Craven Memorial Award in 2016, which is an annual award given by the San Diego Housing Federation to a public employee who has taken unique risks or gone above and beyond the call of duty to facilitate the creation of affordable homes. 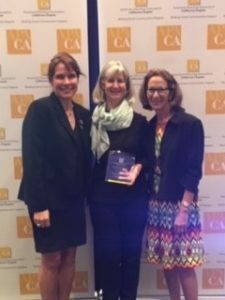 The San Diego APA Section was proud to nominate Susan for a PEN Award. Susan has worked as a planner since 1975. She received a B.A. in American Studies from the University of Colorado-Boulder (CU) with Honors, after attending the University of North Carolina-Chapel Hill for 2.5 years. She also did post-graduate work in historic preservation at CU and city planning at San Diego State University. In the San Diego, she worked as a student intern and assistant planner at the City of La Mesa from 1981-1985), as an associate and senior planner at the City of San Diego (1985-1989), and as a senior regional planner at the San Diego Association of Governments (SANDAG) from 1989-2016). During her time at SANDAG, she worked on a variety of housing- and smart growth-related programs including the Regional Housing Needs Assessment (RHNA) (project manager for 3rd, 4th, and 5th housing element cycles); Regional Growth Forecast local land use inputs (Series 10, 11, 12, and 13); Regional Comprehensive Plan/Sustainable Communities Strategy (Housing Chapter/Appendices); housing legislation (analyzed/commented on state and federal bills); Smart Growth Incentive Program (project manager); Regional Transit Oriented Development Strategy (project manager); Regional Housing Task Force/Working Group and Regional Planning Technical Working Group (project manager); and Intergovernmental Review Program (project manager). Also served as a member of the California Department of Housing and Community Development Housing Element Working Group in the early 2000s and as a member of the San Diego Housing Federation’s policy committee and San Diego Regional Chamber of Commerce Housing Committee for many years working on local housing policy. Susan has been involved in a number of planning-related organizations and activities over the years. She was an active member of Historic Boulder, Inc. during her residence in Boulder, CO. In San Diego she has been an active member of the San Diego Section of the American Planning Association. Her service includes Director Pro Tem and Secretary/Treasurer for several years during the mid to late 1980s; Program Chair (1991-92); Awards Juror and Chair (early 1990s); Administration Chair 1994 California Chapter APA Conference; Mentorship Program participant (Spring 1996); Planning Committee member 1997 National APA Conference; and Awards Committee member (2012-14). She also served for several years as a juror for the San Diego Housing Federation annual awards event and as a planning committee member for the annual conference. She has helped plan and been a speaker/panelist at numerous local, state, and national APA and housing- and planning-related conferences. She also has been a regular speaker at housing and planning classes at San Diego State University and UC San Diego. In the mid-1990s she met with and made presentations to groups of International visitors about planning in the San Diego region through the International Visitors Council of San Diego. She has been the recipient of two awards from the San Diego Housing Federation: Outstanding Leadership award (2001) and the John Craven Memorial Award (2016). In addition, based on her extensive housing-related work at SANDAG, she received a Fannie Mae Foundation Fellowship to attend the Kennedy School Program for Senior Executives in State and Local Government in 2003. Since retiring in December 2016, Susan has been actively involved in several planning and housing related organizations. She is a current board member, board secretary, and Breakfast Dialogue Subcommittee chair for Citizens Coordinate for Century Three (C-3) an almost 60 year old citizen planning organization. She is an active participant (in an advisory role) in the Build Better San Diego Coalition a group of social justice-oriented organizations focused on affordable housing and housing justice issues in the city of San Diego; a stronger inclusionary housing ordinance is one of its major policy initiatives. She also is a board member and volunteer coordinator of San Diegans for Managed Growth/Safeguard Our San Diego Countryside, which recently submitted 107,076 signatures to the County Registrar of Voters to put a measure on the ballot to help stop sprawl development in the unincorporated backcountry of San Diego County. This countywide measure will be on the March 2020 ballot.